What happened to Butter prices in 2008? Did Americans stop eating butter? 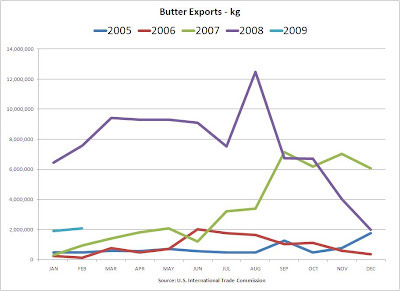 Well maybe a few have "tightened the belt" on butter purchases, but decreasing exports are the real story. Butter is a commodity, and a little change in supply or demand can make a big difference in prices. During 2008, the U.S. dollar went from a weak position vs. other currencies to a strong position. When the dollar is weak, our products look "cheap" on the world market. 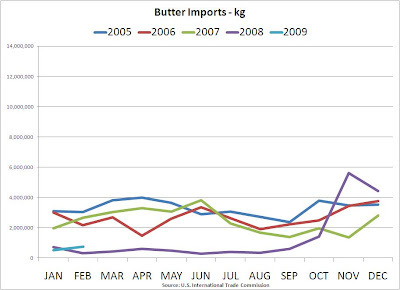 In early 2008, butter exports were GREAT! The increased demand increased prices. But when the U.S. Dollar strengthened near the end of 2008, U.S. produced butter became very expensive on the world market. Demand dropped, and prices fell. The U.S. imports a lot less butter than it exports - typically - but in 2008, as the dollar strengthened, imports started looking cheap and imports surged! The demand for U.S. produced butter fell further, and so did prices. How much did the dollar strengthen against other currencies? The simple answer is "a lot." This change is what has made U.S. butter so expensive on the world market. The chart below shows the U.S. Dollar Index valued against 6 other major currencies as measured by the NYBOT calculated index. The change is nearly 20%. That's a big swing in the price of butter. The world is increasingly connected. What can a dairyman do in this climate? He can't have much impact on exchange rates, but he can manage his business in the best way possible based on all the facts. We need to keep the best facts available to him.